A few months ago, I heard Perry Noble, pastor of Newspring Church in Anderson, SC, was coming out with a new book. I’ve followed Perry for many years and have found his teaching to be very good. I also appreciate his down home manner and humor. His church is growing like mad, so he must be at the top of his game. Clearly, he has his act together. Turns out appearances can be deceiving. 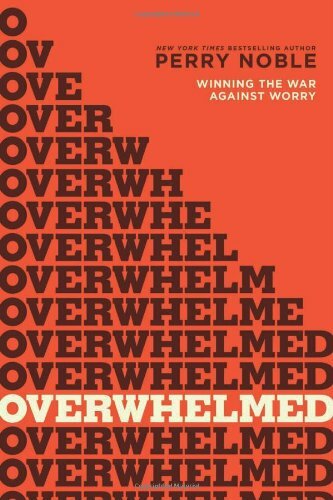 In his soon-to-be-released book, Overwhelmed, he talks about his struggle with depression and feeling, well, overwhelmed. Someone I know was struggling with depression at the time, so I thought I’d sign up to get a pre-release copy for review (having a blog can be handy at times…). While there are 40 chapters in the book, they are all fairly short, so it makes for a quick read. I like the fact that he broke things down into bite-sized chunks. This makes it easy to read a bit, reflect, then go back for more. Perry talks about this story, shares his struggles with depression and how God brought him through it. He gives us some reminders about God’s love for us; reminders that we see every day. He goes on to share things we tend to struggle with and how we can turn those struggles into a deeper walk with the Lord. Finally he acknowledges that life is indeed hard, that we will face pain and struggle, and that God is still faithful. Honestly, it’s a pretty encouraging book. As I read it, I kept thinking that this was as much for me as it was my friend with depression. The more I read the more I felt like this is something most tech directors should read. By nature, we tech leaders see problems and want to fix them. The problem is, we tend to see a lot of problems. By being so aware of so many problems, it’s easy to get into a mode where we think we need to solve all those issues, right now! It doesn’t take too long before we find ourselves working all the time, spending no time with our families and no time resting. I’ve heard several people on church staffs use that excuse for working all the time. And yes, it’s an excuse. We are not called to work all the time. We are called to work for six days and rest. And those shouldn’t be six 12-hour days, either. That pace is not sustainable. And yet, there we go, working like mad, figuring if we don’t get that projection thing figured out today people will surely end up going to hell and it will be our fault. That can be a bit overwhelming. After reading this book, and spending a lot of time thinking about it, I’ve found myself a lot less stressed out at work. Sure, I still desire to do a great job. I still take my job seriously. And I still want to be part of growing the Kingdom. But I don’t feel like it’s my responsibility to do it all myself. As tech leaders, we’re an unusually responsible lot. We own our jobs, and usually several other people’s as well. But that’s not what God calls us to. He calls us to rest in Him, and to do the job He’s called us to do. I found myself convicted and encouraged by this book, often at the same time. If you ever struggle with being discouraged, feeling like you’re not measuring up or have way too much on your plate, give this book a read. It comes out on April 1 (which is a bit ironic), though you can pre-order it now. If I were developing a curriculum for tech directors school, this would be required reading.